You are here: Home / Holiday / Christmas / The Christmas Tradition that is Perfect for Kids Who Snoop! 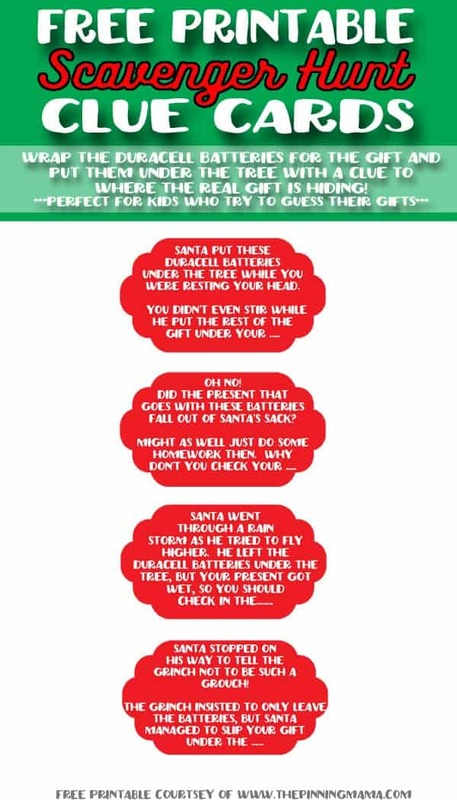 The Christmas Tradition that is Perfect for Kids Who Snoop! This Christmas Tradition is perfect for kids who love to snoop under the tree, shake their gifts and try to guess what they are getting, but it is also tons of fun for those that don’t. This will be one that they remember through the years. ***Plus a HUGE giveaway for $100 to Toys R Us! Scroll to the bottom for giveaway! I partnered with Toys R Us and Duracell to share this fun Christmas Tradition through this post. All ideas, fun and general craziness are 100% our own. I am all about traditions. Christmas, birthdays, even the 4th of July will all get their share from our family! The thing is, there is just so much noise and so much rushing in life. It is so easy to get sucked in to the have to do’s and have to be at’s, especially during the holiday season when there is even more than the usual share of activities and programs. Traditions bring us out of that. They make us pause life for a moment and really enjoy the moment by doing something special, different, or maybe even a little wacky. I know when I think back on my life, those things are the ones that stand out. Over a blessed and full life of family, friends, lots of good meals and stuff that I had to have, the memories I cling to and remember are those that were our traditions. So with that thought, it is my mission to tradition. In my family growing up your gifts had to be a surprise. As a matter of fact, if you “accidentally” found out then that gift magically disappeared you didn’t get it anymore. You can imagine that this has made me have the same zeal for having surprises on Christmas. So I decided to kick it up a notch this year and start a new tradition that has already proved so fun that we will definitely be doing it for years to come! With kids and Christmas comes a lot of toys. And with a lot of toys comes the need for a lot of batteries. I thought why not just make the present opening a little bit more of a surprise and a fun new tradition by not wrapping the toy that they are expecting (and snooping under the tree for.) Instead I wrapped the Duracell batteries that go in the toy and to it I attached a clue. 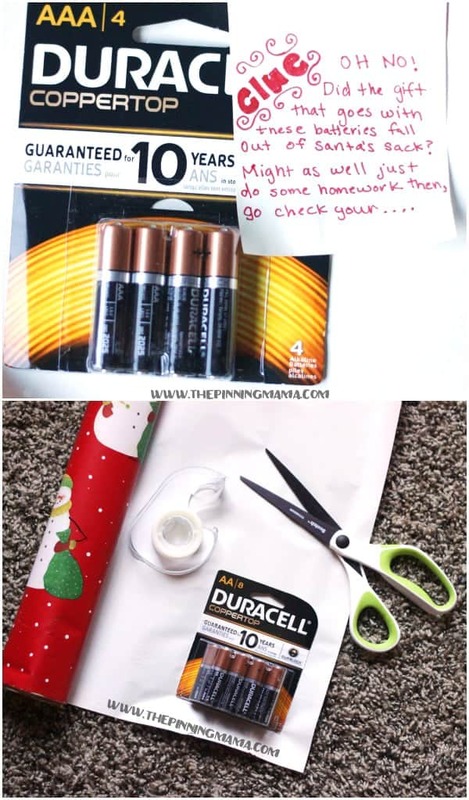 That way when they get to the point in present opening where they get the package of batteries, not only is it a fun element of surprise, but we also get to take a little pause from the madness and all help solve the clue and do a little scavenger hunt to find the real gift! Now I knew my kids were going to be head over heels for this gift! It is a super cool Light Saber from Toys ‘R Us that can connect to make a double light saber, or even more creations. They had no clue though, because the gift that they got was a small neatly wrapped package. Just look at my little guys face when he opened it! Shouldn’t it be one of those “Caption this!” photos? This is exactly why this is the perfect solution for kids who like to snoop under the tree and guess their gifts! They will either be confused or if they figure it out, they will know they have a super awesome gift that isn’t under the tree and is not to be guessed! My kids are pretty little still so we kept the clues simple, but I dream of how much fun we will have coming up with clues to stump them as they grow. 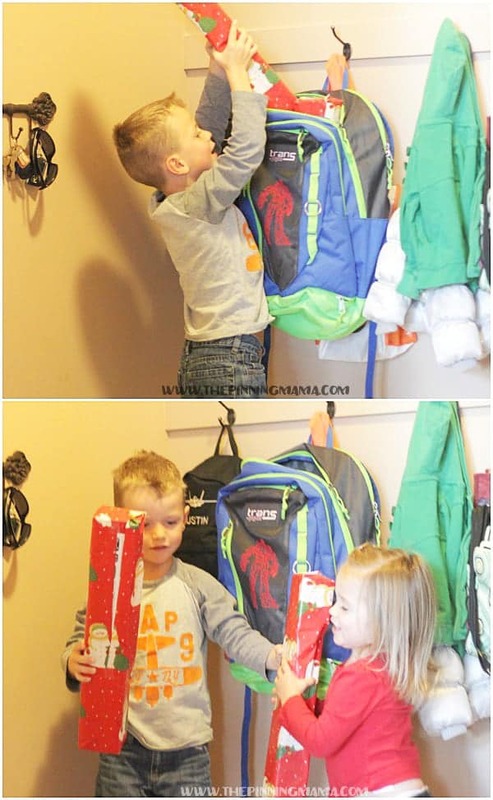 The kids figured out that the word for the blank was backpack and ran into the mud room to go check there! Of course they then dove right in and ripped the paper open. They were both pretty excited about what was beneath the paper! This is the priceless look I live for! These light sabers are AWESOME! Not only do they light up, but they actually react to the motion and make noises accordingly. Then to top it off, it comes with a connector so that you can hook them both together so that you don’t just have one light saber, but a double one. There is even a guide that comes in the package that shows all of the ways that you can connect these scalable light sabers together and he spent far longer than I like to admit just studying that. You can find these and all the Duracell batteries to power them at Toys R Us. Toys R Us is always our first stop during the holiday season because they have everything from A-Z in the kid department! Any toys from educational to character to video games and bicycles, scooters and more. We can knock most of our list out from the baby to our oldest with just that one stop. And when you have 3 busy kids time is my most valuable commodity these days so I appreciate that more than ever! To make it even easier for you, I made a free printable with clue tags you can print out, cut and attach right to your batteries to go under the tree. Just scroll to the bottom for a printable download. My husband and I almost died laughing as we went through the pictures later that night. Her expressions are just priceless. She is trying so hard and very serious about her Jedi training. Her brother keeps up with her stride for stride and even teaches her a few things every now and again. You can tell that he is just as serious about his Jedi training. We were getting pretty intense inside so we had to move outside to continue the Jedi training. The wide open space proved to be just what that Padawan needed to really perfect his moves. Yup, she’s a feisty one! At the end of the day though, I look back and think about all the fun we had. Getting the surprise gift of the batteries. 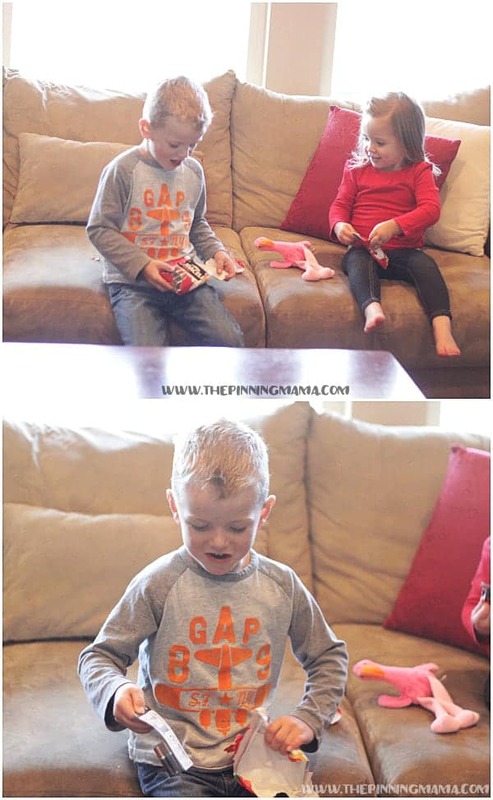 The excitement of going on the special Christmas gift scavenger hunt to find the real present. 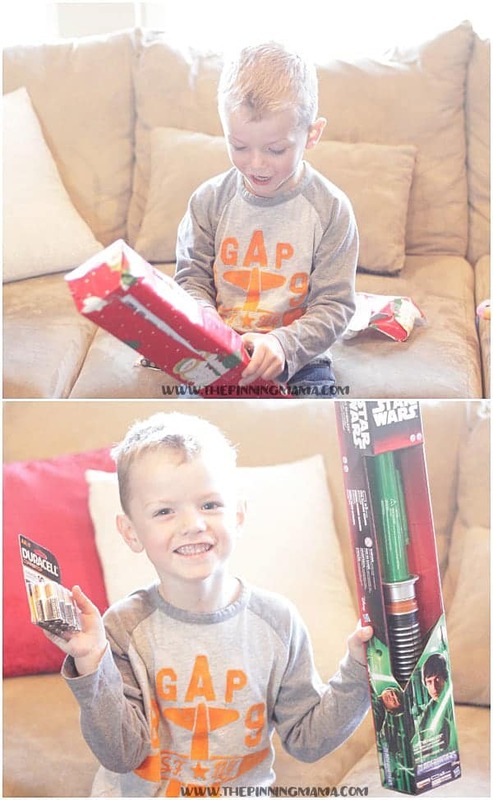 Then putting it all together to watch their faces light up as bright as their light saber when they heard the sounds, saw the lights, and got to play to their little heart’s content. 1. Holidays are more fun with traditions! They are what memories are made of! 2. Spend less time shopping, and more time with your family this holiday season! Toys R Us is a one stop shop for all the kid’s holiday fun. And Star Wars toys are the hottest toy for kids this season! 3. Don’t forget the batteries! Toys aren’t nearly as much fun when they don’t work! Scroll to the bottom for the Free Printable Christmas Scavenger Hunt download. But before you do make sure and enter the fantastic giveaway below for a $100 Toys R Us gift card below. That is a great start on any Christmas Shopping! Free Printable Christmas Scavenger Hunt Download here! I would love to have the Star Wars: Episode VII The Force Awakens – 10.5 Inch Classic U-COMMAND AT-AT. The Star Wars toy that I love is the Star Wars: Episode VII The Force Awakens – Stormtrooper™ 16 Inch Animatronic Interactive Figure. I like the Air Hogs Star Wars Remote Control Ultimate Millennium Falcon Quad. I would buy the air hogstar wars x-wing fighter formy son. I love the Star Wars Guess Who? game. My son would like the Air Hogs Star Wars X-Wing Fighter. This is such a cool idea! I want to get the R2-D2™ Interactive Robotic Droid for my little boy! It’s so cool!!! I like the Lego Star Wars Millenium Falcon. I like the Air Hogs Star Wars X-Wing Fighter. I like the star wars16 in interactive figures. I really like the Spin Master Games – Star Wars Death Star Perplexus. I like the Star Wars: Episode VII The Force Awakens Yoda Pillowtime Pal. I’m definitely digging the Star Wars: Episode VII The Force Awakens Yoda Pillowtime Pal. It’s just so darn cute. I would like the star wars chess game. My 8 year old says he loves the R2D2 Robot Droid. Thanks bunches!!! I like the Star Wars: Episode VII The Force Awakens – R2-D2™ Interactive Robotic Droid. I like the Star Wars NERF Episode VII First Order Stormtrooper Deluxe Blaster. I also like the Play-Doh Star Wars Luke Skywalker and R2-D2 can-heads. I would love the Lego Star Wars t-16 skyhopper! The Star Wars item I would like to have is the Star Wars: Episode VII The Force Awakens-R2-D2 Interactive Robotic Droid. My son loves Star Wars and robots so this would be awesome for him! I can see my husband and children having hours of fun with the Air Hogs Star Wars Remote Control Ultimate Millennium Falcon Quad. Star Wars The Force Awakens 3.75-inch Vehicle First Order Special Forces TIE Fighter. Because really, it’s awesome. I would love to have the Air Hogs Star Wars: Episode VII The Force Awakens Remote Control Millenium Falcon. Oh my goodness. I love the Star Wars: Episode VII The Force Awakens Furbacca! How cute! My kids would want the Star Wars: Episode VII The Force Awakens – R2-D2™ Interactive Robotic Droid. Star Wars: Episode VII The Force Awakens – R2-D2™ Interactive Robotic Droid is on my wishlist. Oh he would also really love the Hot Wheels Star Wars Escape from Jakku Play Set! My kids would go crazy for the Star Wars Darth Vader Headphones. The Star Wars Command Epic Assault Set is pretty cool! I love the Star Wars: Episode VII The Force Awakens Furbacca! LEGO Star Wars Advent Calendar because it looks like something I can do with my Granddaughter. Wanted you to know your Pintrest repin link is not coming up on 11.23.15 at 3:30 PM PST. I’d love to have the Star Wars: Episode VII The Force Awakens – R2-D2™ Interactive Robotic Droid. I would love the Star Wars Legendary Jedi Master Yoda – Collector Box Edition! I love the LEGO Star Wars Darth Vader 75111 action figure. We love Legos, so the LEGO Star Wars The Inquisitor would be great for my eldest. Wished they had some Star Wars legos for younger kids too. the collecter box edition for my nephew! The Star Wars: Episode VII The Force Awakens – R2-D2™ Interactive Robotic Droid looks like such a cool toy, I would even want to play with it! I would purchase some disney infinity star wars 3.0 stuff. I love the LEGO Star Wars Millennium Falcon! I love the Star Wars: Episode VII The Force Awakens Yoda Pillowtime Pal. I like the Air Hogs Star Wars Remote Control Ultimate Millennium Falcon Quad! I would love to get the LEGO Minecraft The Mine for my son! I like the Star Wars Lego Millennium Falcon. My sons would love the Star Wars: Episode VII The Force Awakens – R2-D2™ Interactive Robotic Droid. Star Wars Force Trainer II – The Hologram Experience is so cool. I think thatt would be an awesome gift. My neohew would be gaga over that! My kids love SW. I would love to get my son the Air Hogs Star Wars Remote Control Ultimate Millennium Falcon Quad. He would love it. I like Star Wars Force Trainer II .